Active preparation for discussion improves learning. Small group discussion (as opposed to whole class) can increase participation and student perceptions of learning. Grading participation improves participation in discussion. Comfort with discussion and class community improves the level of student learning. Cold calling on students can increase voluntary participation, comfort with discussion, and learning. Try out some of these IDEAs this semester! What it is: Students begin by working alone, then in pairs, then in groups of four, then in groups of eight. The instructor provides questions or tasks of increasing complexity. How to do it: 1) Provide a question or task for students to complete individually under time constraint. 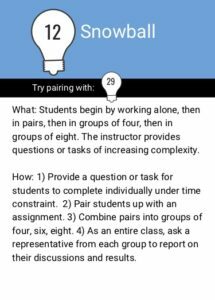 2) Pair students up with an assignment. 3) Combine pairs into groups of four, six, eight. 4) As an entire class, ask a representative from each group to report on their discussions and results. What it is: Students examine an actual event, whether recent or from the distant past, and discuss how the outcome that surrounded the event might differ if one crucial condition were changed. How to do it: 1) Provide students with time to prepare. 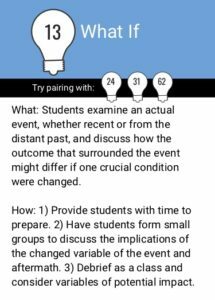 2) Have students form small groups to discuss the implications of the changed variable of the event and aftermath. 3) Debrief as a class and consider variables of potential impact. What it is: Students have a brief opportunity to think about an issue, discuss with a paired partner, and then share thoughts with the class. How to do it: 1) Pose a question for the students to consider. Have the students consider their answers individually. 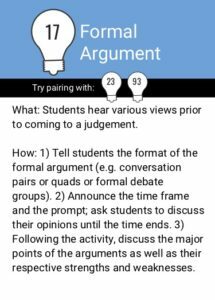 2) Ask students to pair up and discuss their ideas and opinions. 3) Ask some or all of the groups to share their insights with the class. Tip: This activity can also be done virtually using discussion boards. 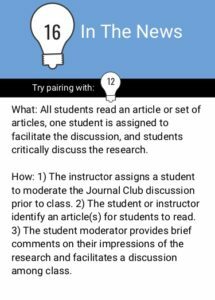 What it is: All students read an article or set of articles, one student is assigned to facilitate the discussion, and students critically discuss the research. How to do it: 1) The instructor assigns a student to moderate the Journal Club discussion prior to class. 2) The student or instructor identify an article(s) for students to read. 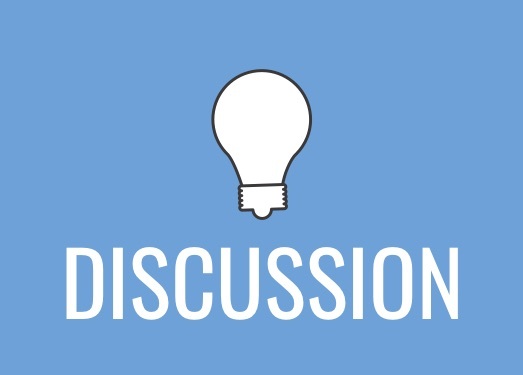 3) The student moderator provides brief comments on their impressions of the research and facilitates a discussion among class. What it is: Students hear various views prior to coming to a judgment. How to do it: 1) Tell students the format of the formal argument (e.g. conversation pairs or quads or formal debate groups). 2) Announce the time frame and the prompt; ask students to discuss their opinions until the time ends. 3) Following the activity, discuss the major points of the arguments as well as their respective strengths and weaknesses. 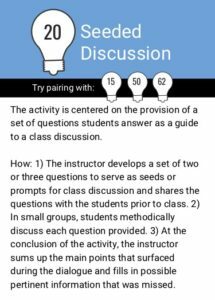 What it is: The activity is centered on the provision of a set of questions students answer as a guide to a class discussion. How to do it: 1) The instructor develops a set of two or three questions to serve as seeds or prompts for class discussion and shares the questions with the students prior to class. 2) In small groups, students methodically discuss each question provided. 3) At the conclusion of the activity, the instructor sums up the main points that surfaced during the dialogue and fills in possible pertinent information that was missed. 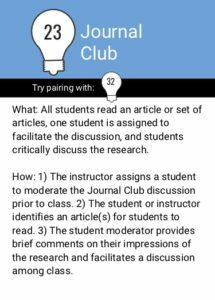 How to do it: 1) The instructor assigns a student to moderate the Journal Club discussion prior to class. 2) The student or instructor identifies an article(s) for students to read. 3) The student moderator provides brief comments on their impressions of the research and facilitates a discussion among class. What it is: The instructor presents the case using discussion as an entire class or with small groups. How to do it: 1) Distribute the case for students to read prior to class or allow time in class for students to read through. 2) Present small groups with a set of questions, and ask them to work through them. 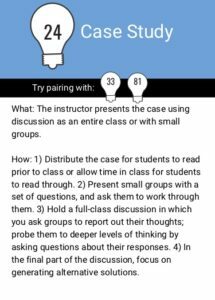 3) Hold a full-class discussion in which you ask groups to report out their thoughts; probe them to deeper levels of thinking by asking questions about their responses. 4) In the final part of the discussion, focus on generating alternative solutions. Print out the full set of ITI IDEA cards here.